When trying to decide on a paint color for your kitchen, you may wonder whether you should go with a soft neutral or a trendy, bold hue. While bolder colors are popular, neutral kitchen wall colors can instantly give your space some classic style that stands the test of time. The following neutral kitchen wall painting ideas are ideal for any style of home from modern to country to traditional. If you have white cabinets or stone countertops, pair a soft warm gray on your kitchen walls. The warmth of the gray will create a slight contrast against the walls and complement the tones in the stone. If your kitchen has a nice amount of natural light, paint your walls in a light, cool gray. Some lighter grays have light-reflecting qualities and will make your kitchen look clean, crisp, and inviting. If you have natural hardwood floors, warm gray on the walls will add some style and help tie the room together. Paint your walls in a warmer, yellow-beige and then layer other shades of beige throughout your kitchen. Think beige and browns in your backsplash, an accent wall in a complementary tone, and a lighter beige on your cabinets or kitchen island. Pair bright white cabinets, chairs, trim and decorative accents with a brown-beige on your kitchen walls. This will create a nice, bold contrast while keeping your kitchen neutral in color. Paint a light beige on your kitchen walls and complement it with earth tones in your kitchen lights, chairs, and textiles. This will help even the most contemporary kitchen look warm and inviting. If you have white cabinets, stainless steel appliances, and subway tile paint your walls white to make your space look brighter, on-trend, and minimalist. Then, add some subtle color to your space with brighter décor and accent pieces. Paint kitchen walls white and pair them with brass accents for an updated “antique” look. Think brass range hoods, drawer and cabinet handles, and even brass cookware. Pair oak floors and a butcher block counter with white walls and wooden cabinetry for a vintage-inspired cooking space. Pair a sage green on your kitchen walls with white kitchen cabinets and white, subway tile backsplash to create a calming ambiance. If you have stained wooden cabinets and trim, a lighter shade of green will complement the warm tones perfectly. Paint your walls in a light yellow and pair the new color with your Douglas fir flooring or bamboo flooring to create perfect contrast. Paint your walls in a pale “buttery” yellow and use teal or aqua decorative accents such as floor runners, chairs, and more fun pieces to liven up your space. These are just some of our favorite kitchen wall painting ideas. No matter what neutral paint color you choose for your kitchen, the options for neutral walls, accents and decor are limitless. When you trust your kitchen painting project to professional interior wall painters, you can rest assured that your kitchen will look exactly as you envisioned it. 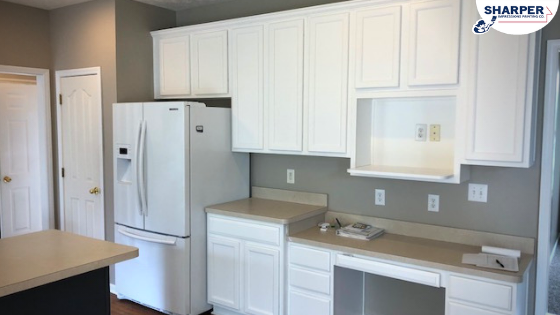 At Sharper Impressions, we not only provide you with an experienced team of painters, but also offer free, professional paint color consultations to help you choose the right neutral for your kitchen walls, cabinets, and more. Get your free interior painting quote today!